PART OF MY PLANNING ROUTINE ALWAYS CONSISTS OF DOING TECHNOLOGY RESEARCH. APPS CAN BE EXTREMELY VALUABLE, FREE TOOLS FOR GETTING THE MOST OUT OF YOUR VACATION. MANY CITIES/ATTRACTIONS HAVE THEIR OWN APPS, BUT HERE ARE A FEW OF MY GENERAL FAVORITES FOR OPTIMAL ORGANIZATION. tripRIDER - This app fulfills all of my type-A organizational fantasies. Unlike many travel tools that try to provide you with lame suggestions on where to go, TripRider strictly focuses on organization and documentation. For less than $5 for the premium version (or get the Lite version for free), you can create an hour by hour itinerary, track your expenses, put together a personalized packing list, take notes, document memories AND print a PDF Trip Book with everything combined into a single document. The only negative is that they haven't created a flawless system for syncing between your devices (but it's possible, and not that hard to do). evernoteFOOD - I definitely travel through my stomach, so keeping track of my favorite dining experiences is important. Evernote Food gives you the mobile ability to track all of your foodie spots with ease. 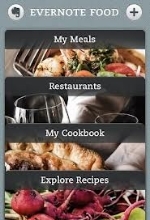 Each entry allows you to pin your location, take notes on your meal and arrange your yummy photos for future reference. This has been especially helpful for remembering a great bottle of wine or a new taste that I will want to remember the next time I come. openTABLE - Keep track of all of your dinner reservations in one spot. The Open Table app is straight forward and easy to use and provides you with valuable reviews when searching for somewhere to eat. I personally trust Open Table reviews more than Yelp because these are users who make reservations, which may not sound like much, but it's a small differentiation that makes a big difference. The app also allows you to quickly change your dinner reservation, make a new one on the go and review your experience.